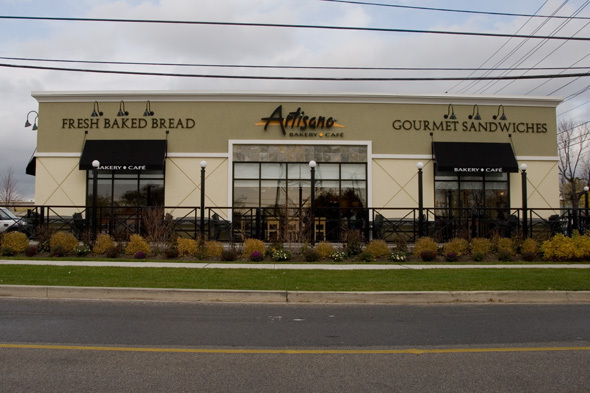 Artisano Bakery Cafe on Islington offers more than just freshly baked breads. I stopped in with a friend this week after hearing him rave about their lunch offerings, and was delighted to find they offer a huge selection of "gourmet sandwiches" and soups for all tastes. The cafe counter sits in front of a wall of boards with all the specials and standard sandwich offerings staring you down. It's a heck of a lot to process, but mostly because I kind of want to try everything . I buy some time as my friend orders up his reason to be there: The Turkey, Brie & Green Apple sandwich. 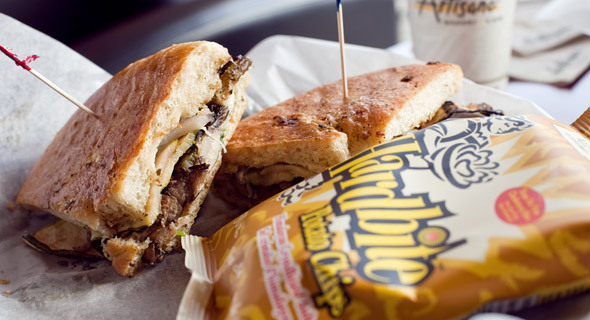 I wind up going with the Grilled Vegetable, Portobello & Arugula toasted panino, myself. Both sandwiches come with a slice of pickle and choice of chips or an apple. With our bills comes a buzzer device. We're told to find a seat in the cafe -- we'll get a vibrating notification when our lunches are ready. Moments later, he's buzzing and the Turkey, Brie & Green Apple is ready. Pictured at the top, this is a non-toasted sandwich on a fresh bun. The blend of tart apple with creamy brie, along with a cranberry mayo makes this one work of sensory art and he loves every minute of it. My buzzer goes off just as I take the photo, and most of his sandwich is gone before I return. My toasted sandwich arrives hot and stuffed with big chunks of portobello, zucchini, onions and eggplant all held together with pesto and provolone cheese. The bun is an onion focaccia that compliments the dark rich veggies within. The only thing I would have asked for more of is arugula. There were surprisingly few leaves of it considering it's a title ingredient. Still, this was a quality sandwich and a really filling one too. I considered just packing up the second half for later, but the smell of those fresh ingredients did me in. Both sandwiches were about $8 + tax, including chips/apple side and well worth it. If I'm ever in the area around lunch again, I know exactly where to stop. Food photos by Tanja-Tiziana .